Home » Posts Tagged "guns on campus"
A packed committee room greeted the House Insurance Committee early this morning as they took up HB 2798, a bill essentially forcing school districts to arm teachers as the legislative response repeated mass shootings in schools, the Parkland Student Movement and the March for Our Lives held this past weekend. The bill popped up unexpectedly late last week and Friday afternoon was scheduled for a hearing this morning. Anyway, because, as the proponents were fond of saying today, “There’s nothing we can do stop mass shootings in our schools,” they want to arm teachers. Let the teacher get her kids safe and quiet, then just pull out a gun and go in search of the shooter is apparently the solution to gun violence in schools. Other proponents were the Kansas Rifle Association (our state NRA), a high school teacher and Iraq war veteran from Wichita, and a gun range owner/former security officer. Opponents started with KNEA lobbyist Mark Desetti followed by Shawnee Mission Interim Superintendent Rick Atha, David Smith from KCK Public Schools, Olathe Public Education Network, The Mainstream Coalition, Moms Demand Action, Kansas Interfaith Action, a mother who spent time in lockdown at school with her kindergartener during a false alarm, a mom and attorney from KCK (pointing out many legal flaws in the proponents arguements), two parents from Education First Shawnee Mission, a parent from Blue Valley Schools, a school secretary from Lawrence, and a woman whose daughter was a victim of gun violence and is now raising her grandchildren. You can view a segment of today’s testimony as posted by Loud Light- facebook https://www.facebook.com/BeALoudLight/ – (including that by KNEA lobbyist Mark Desetti beginning at 09:01 below). 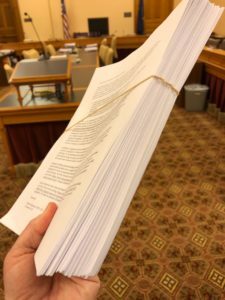 In addition, there were more than 300 pages of written testimony in opposition to the bill. It is clear that there is overwhelming opposition to this bill. We will continue to watch this bill to see if Chairman Vickrey intends to work the bill and attempt to send it to the full House. If you have not yet weighed in on this bill with the members of the House Insurance Committee and your own legislator, we would urge you to do so now. Later, in the full House, debate was taken up on HB 2773, the safe and secure schools act. This bill does some good. It sets standards for school security, it sets standards for school safety plans, it requires school districts to create school safety plans and it provides $5 million in matching grants for school security upgrades. It also allows school districts to offer students firearm safety training so they know what to do should they encounter a weapon. 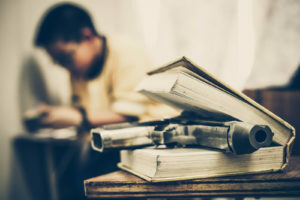 While KNEA supported this bill in a hearing, we were clear to state that it does very little to address the problem of violence in our society and shootings in our schools. It is a mere band-aid on a wound from an assault rifle. But it is a step in the right direction. A number of amendments were offered on the bill on the House floor today that were supported by KNEA but did not pass. One was an amendment by Rep. Stephanie Clayton (R-Overland Park) who tried to strip out reference to the NRA and the Eddie Eagle program relying instead on Kansans to make decisions for Kansans. The amendment failed on a vote of 49 to 75. An amendment by Rep. Henry Helgerson (R-Wichita) would have provided for ongoing funding or school security improvements through fees on firearms and ammunition – $1.00 per gun purchase and 1 cent per bullet purchase. As the bill is, funding is $5 million total and ends after one year. The Helgerson amendment failed on a vote of 35 to 88. Rep. Brett Parker offered an amendment to provide $100,000 to survey school employees about what they would like to have to address the issue and to repeal the law that currently allows school districts to let teachers carry firearms in classrooms. (No districts do.) The amendment was divided into two parts. A vote on the funding for the survey failed on a vote of 50 to 72. Most interesting to us was the debate on the second part, repealing the ability of school boards to allow concealed carry on school campuses. 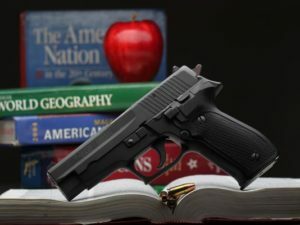 Proponents of guns in classrooms like Rep. John Whitmer (R-Wichita) or Blake Carpenter (R-Derby) argued in favor of the sanctity of “local control.” Of course, whenever there is a vote on granting institutions of higher education or municipalities local control over gun issues, they argue the critical importance of state mandates. So, if local control results in more guns – YES. 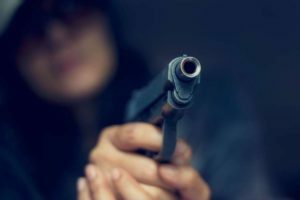 If local control resulted in fewer guns – NO. This is the very definition of hypocrisy. This amendment failed on a vote of 44 to 79. The bill was advanced to a final action vote which will come tomorrow. The full Senate debated three bills and advanced all three to final action. The first bill was Sub for HB 2602 establishing the dyslexia task force. This bill, strongly supported by KNEA was advanced on a voice vote with little discussion. Next (although much later) was SB 352, a bill dealing with transportation funding. This bill moves the funding of school transportation from the highway department to the state general fund and then establishes a new “curve of best fit” (codifying what the state department of education has been doing for years). This bill also generated little discussion and was advanced on a voice vote. The third bill was SB 422 which deals with equity issues in the Supreme Court’s Gannon ruling. SB 422 would repeal two provisions of SB 19 – the 10% at-risk floor and the expansion of capital outlay expenditures as called for in the Court ruling. Additionally, it would use the current year to determine LOB state aid while requiring districts to notify the state of an intent to raise LOB by March 15. It would also allow the protest petition process for any increases in LOB over 30% and repeal any high LOB that had not been subject to an election (none that we know of). There was an attempt by Sen. Pat Pettey (D-Kansas City) to repeal the notice requirement since it comes before the Legislature sets budgets for the coming year, but that effort failed. Senator Hensley (D-Topeka) then offered an amendment to deal with adequacy by proposing a $200 million increase in funding each year for three years as called for by the State Board of Education. The amendment failed on a vote of 10 to 28 with all nine Democrats and Independent John Doll (I-Garden City) voting YES. A subsequent Hensley amendment would raise funding by $151 million in 2018-19, and $150 million in 2019-20 and 2020-21 for a total of $451 million (the “maintain the status quo” figure in the new cost study). That amendment failed on a vote of 10-26 again with Independent John Doll joining the Democrats in support. The bill was then advanced to final action. There was not much specifically dealing with education in either chamber today but one pays attention anyway because, well…you never know! So it was on the House floor today on HB 2644, a bill dealing with budgeting at postsecondary educational institutions in Kansas. Rep. Elizabeth Bishop (D-Wichita) offered an amendment to insert language ending campus carry on Kansas college and university campuses. Leaping to his feet was Rep. John Whitmer (R-Wichita), a gun enthusiast to challenge the germaneness of the amendment. The rules committee deemed that there was only one point of contact between the underlying bill and the amendment and so it was ruled not germane. Too bad college campuses will remain subject to concealed carry even over the objection of faculty, student groups, and parents. Tomorrow, the House Insurance Committee will hold a hearing on HB 2789, the bill forcing school districts to arm teachers. Bill architects pretend it is “permissive” but one section ensures the if a district chooses not to arm teachers and some incident should occur, the district will be assumed to have been negligent in protecting students. The hearing will be at 8:00 am and you should be able to listen in online at this link: http://sg001-harmony.sliq.net/00287/Harmony/en/View/Calendar/ From there click on the Insurance Committee. It’s not too late to add your name to Rep. Brett Parker’s (D) petition to “oppose militarizing teachers.” Rep. Parker is a teacher and KNEA member from Johnson County who is a member of the House Insurance Committee. CLICK HERE to add your name to Rep. Parker’s petition. We started the day in the Senate Assessment and Taxation Committee where there was a hearing on Senate Concurrent Resolution (SCR) 1604, a constitutional amendment sponsored by Senators Holland, Faust-Goudeau, Francisco, Haley, Hawk, Hensley, Pettey, Pilcher-Cook, and Rogers. SCR 1604, if passed by the legislature and then approved by the electorate would amend the Kansas constitution to require that the state sales tax on food would be set at 4% beginning July 1, 2019, and drop to 2% on July 1, 2020. It would stay at that level thereafter. 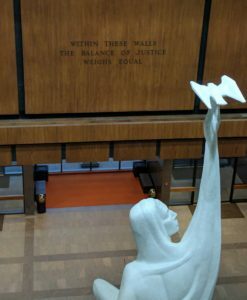 Proponents included a grocer from Bird City who spoke of the problem of Kansans driving across the border to buy groceries in Nebraska, advocates for children’s nutrition and the poor, and a farmer from Douglas County. As part of KNEA’s legislative agenda, we advocate for a reduction in or the elimination of the food sales tax but want it to be done as part of a comprehensive restructuring of the state’s tax system. The Department of Revenue reported that passage of the amendment would result in the loss to the state’s general fund of $128 million in revenue in the first year and $246.4 million in the second provided that the change only applied to groceries. It would be a greater loss if it also applied to restaurants. We understand that, as written, it would apply to both. Without another tax change to offset the lost revenue, we would once again be facing difficult decisions when it comes to funding state services. Senator Holland said that the intent was for it to apply only to groceries. Kansas has the second highest food sales tax in the nation and the highest one regionally. This change would only apply to the state sales tax rate so, in the first year, shoppers would pay a tax of 4% plus any local sales tax levy. Committee Chair Caryn Tyson (R-Parker) asked why this was in a constitutional amendment and not in a statutory change. Some Senators indicated they were open to making the change statutorily. We believe that tax rates should not be set in the constitution. Where that is done, the legislature has no ability to make adjustments in rates to deal with changing economic conditions without seeking another constitutional amendment. Tax rates should be handled via statutes, not constitutional provisions. No action was taken on the resolution today. The full House today debated HB 2042, a bill recognizing conceal carry permits from other states and allowing such permit holders to carry a concealed firearm in Kansas. Three amendments of interest were offered today. The first amendment by Rep. Brenda Landwehr, which passed on a vote of 82-42, lowers the age for a concealed carry permit from 21 to 18. The second one by Rep. Barbara Ballard (D-Lawrence) would have repealed the campus carry provision in law under which anyone 21 and older can carry a gun on any campus at any time. Ballard’s amendment would return decision making on firearms policy to the campuses. Some could choose to allow firearms, others could prohibit them. Ballard’s amendment failed on a vote of 53-69. The third amendment was offered by Rep. Clay Aurand (R-Belleville). Aurand’s amendment would restrict campus carry to concealed carry permit holders only. Under current law, no permit is required to carry a concealed firearm. Aurand’s amendment was adopted on a vote of 70-52. The bill was then advanced to final action on a voice vote. The final action vote will come tomorrow. The end result is that, if passed and signed into law, this bill would allow any concealed carry permit holder 18 and older to carry a firearm on a post-secondary campus. Today, anyone 21 and older can carry with or without a permit. The most interest arguments were made on the Landwehr amendment. Proponents actually argued that we should lower the age because other states have done it. Remember when your child told you,”but everyone’s doing it?” Another argument was that if one is old enough to join the military and fight for our country, one should be allowed to carry a concealed firearm. Interestingly, that’s the same argument made for lowering the drinking age to 18. There has been no bill to do that. Governor Brownback took his time about it, but yesterday he finally signed SB 19, the new school finance proposal passed by the House and Senate. Of course, in his signing statement, he had to take the opportunity to complain about the Legislature’s work product saying, “The Legislature missed an opportunity to substantially improve the K-12 funding system.” We suppose he still preferred his unconstitutional block grant system that froze funding thereby helping to pay for his tax cuts for the wealthiest Kansans. But if Brownback won’t, we will give the Legislature credit for listening, debating, sometimes arguing and eventually coming to a consensus about this new proposed formula. House K-12 Budget Committee Chairman Larry Campbell (R-Olathe) spent the entire session with his committee researching, hearing testimony, studying data and coming to the conclusion that the “old” formula was not terribly flawed and simply needed some adjustments. The House bill was then the framework that Senate Select Committee on School Finance Chairman Jim Denning used with his committee members to guide their work. We believe that when the Supreme Court is done with their review, they will find the finance formula in SB 19 by and large to be constitutional. There are a couple of issues in the bill that might give them concern- particularly around equalization- but the bill does target funding to the students who need the most help and does so in a rational manner. We also believe that the Supreme Court will likely rule that the funding is not adequate – particularly after the first year. Remember when we say this that the only people who get to decide are the members of the Court! We can only speculate. What might the Court do? The Court could simply rule that SB 19 does not adequately address Gannon and send the Legislature back to the drawing board in a special session. Another possibility is that the Court approves the formula, perhaps putting a stay on one or two items as “disequalizing,” but call the funding inadequate and send the Legislature back to work in a special session. A third possibility is that the Court approves the formula, approves the first year of funding, and gives the Legislature another year to address the adequacy of funding in the out years. What we do know is that there is June 30 deadline. The Court has said they will take this case on an expedited basis. Between now and the deadline, they will need to hear the State’s defense and the Plaintiff’s arguments. Don’t look for this process to be a couple of days and done! The Governor also announced that he would allow the newest gun bill to become law without his signature because the Legislature did not cave to the NRA-written “compromise” on guns in state mental hospitals. State Hospitals, the KU Medical Center, and all public colleges and universities in Kansas have until July 1, 2017, to either provide metal detectors and security personnel at all entrances or allow concealed firearms to by carried by anyone anywhere anytime – no permit or training necessary. Several times this session legislators tried to get the law changed for colleges and universities but despite overwhelming public support for allowing colleges to restrict firearms, the NRA demanded blind obedience to their position that guns should be everywhere and the legislation never moved. 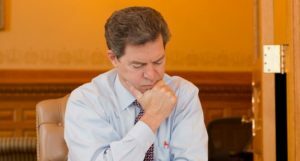 It wasn’t until Brownback – who enthusiastically signed the bill opening mental hospitals and colleges to guns – asked for $24 million to secure entrances to mental hospitals for one year that people realized the full extent of meeting the requirement. A bill was then drafted to allow hospitals to ban weapons but the NRA stepped in to fight the bill. Seeing it would likely pass, the NRA then drafted an amendment that would not make them have security but instead allow guns in reception and parking lots, but the hospital would have to provide gun lockers for anyone with a gun seeking to go into patient areas. In fighting for this amendment, one Senator actually said: “this is the amendment the NRA will allow us to adopt.” Despite the NRA “permission,” the Legislature passed the bill giving hospitals the right to regulate guns on hospital property. This was a loss for the NRA, and this is why the Governor only reluctantly will allow the bill to become law without his signature. And for those of you working in our technical colleges, community colleges, and universities, it looks like guns will be a reality in your classrooms starting July 1. The House this morning did not concur in the Senate changes to HB 2186 (a House judiciary bill turned into a Senate school finance bill) and so a conference committee has now been formed. This action allows the work of putting together what will likely be the last school finance bill of the regular session. With the Senate embroiled in a gun bill debate, the conference committee plans to meet today. It may be just a preliminary meeting as the House will reconvene at 5:00 to take up the newly passed gun bill. The Senate debated Senate Sub for House Bill 2278 which would allow state hospitals to ban firearms. This issue has been a hot topic all session and wrapped up in it additionally have been attempts also to allow colleges to ban firearms. The Governor and hard right conservatives passed a law a few years ago that opened essentially every public area in the state – colleges, municipal buildings, state hospitals, etc. – along with “constitutional carry” that allows the carrying of concealed firearms without a permit or training (although both still exist). The law prohibits state hospitals from disallowing weapons on their premises unless all entrances are secured with metal detectors and security personnel. The cost for such security exceeds $24 million annually. It wasn’t until the Governor learned of these costs that there was a sudden cry to change the law as it relates to hospitals. Sadly, the Governor and his NRA allies have no concern whatsoever about the cost to colleges and universities, so adding colleges to the bill protecting hospitals would jeopardize the attempt to help the hospitals. The bill came to the floor with only the change for hospitals and a plea from Senator McGinn (R-Sedgwick), who was carrying the bill on the floor, to please not add amendments for fear of losing the bill entirely. Supporters of banning guns from colleges agreed to support the bill as-is while noting their desire to take the fight for colleges forward. Of course, the NRA objected strongly to banning weapons from our state mental hospitals but sensing support for the effort, NRA lobbyists wrote an amendment that would allow guns in the hospital parking lots and reception areas. Further, the NRA amendment would require that, if a hospital wished to ban guns beyond reception, it would have to provide secure gun lockers. Senator Susan Wagle (R-Wichita) offered the NRA amendment and remarkably in her closing remarks actually said, “The NRA chose to allow us” to adopt their amendment. The Senate rallied behind Senator McGinn and the hospitals and defeated the NRA-written amendment on a vote of 16 to 24. Senator Masterson (R-Andover) then offered an amendment to allow colleges to ban firearms also noting when questioned, that he would not support such an amendment. This was a cynical offer, intended to get supporters of the colleges to vote against the amendment to protect the underlying bill. Alternatively, Masterson was working from the knowledge that if the amendment were approved, the underlying bill would likely be defeated or vetoed and the NRA would carry the day. The Masterson amendment failed on a vote of 5 to 29. Senator Alley (R-Arkansas City) offered an amendment to get gun safety programs based on the NRA’s “Eddie Eagle” program into Kansas public schools. His amendment was ruled non-germane and so was not considered. As the debate was winding down, Senator Olson (R-Olathe) made the argument that everyone should be allowed to carry guns anywhere they want whenever they want on the off chance that a bad guy might be there. He made the point that he thought this happened once in his district back in 1985 although he wasn’t entirely sure, but someone had told him. And for the second time, he asserted that these killings only happen in “gun-free” zones because the bad guys wander the streets looking for “no guns” signs. He also explained that people die in KU Med all the time. Olson then made a motion to dual refer the bill back to both Ways and Means and Federal and State Affairs, Fed and State Affairs being a more NRA-friendly committee. This tactic is often used to kill a bill. Both committees have to send it back to the floor, and it is sent to one that just won’t act. Olson’s motion failed on a vote of 11 to 27. Senator Pilcher-Cook offered an amendment to prohibit colleges from adopting any regulations regarding guns or ammunition. They could, she said, put up signs telling students it might not be a good idea to carry ammo into a lab where it could explode. This amendment failed on a voice vote. The bill was approved on a final action vote and upon final action- done immediately- the bill was passed by a vote of 24 to 16. KNEA supports a safe learning environment for all students. Part of this is allowing the colleges and universities to make the determination about the carrying of weapons for themselves and in the best interests of their students, staff, and community.